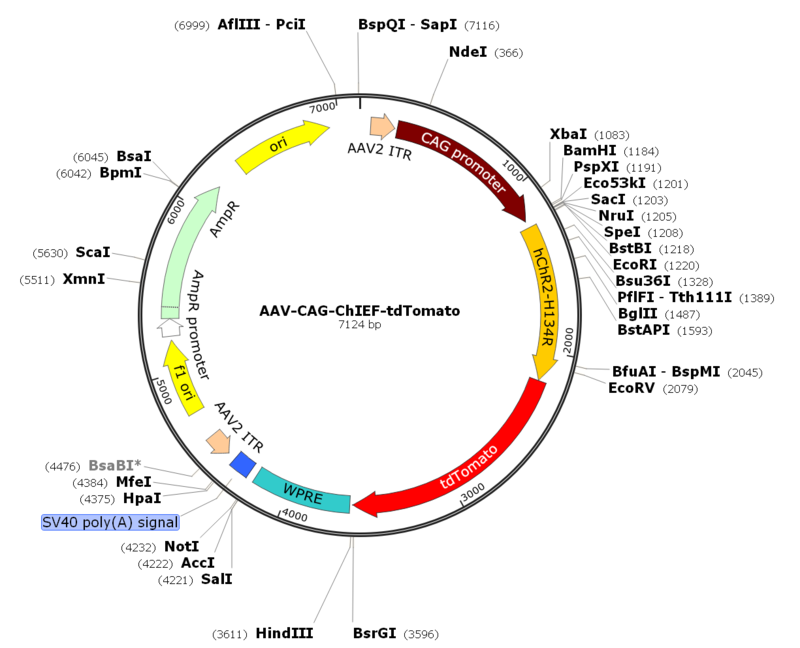 Description: AAV2-ChIEF-tdTOMATO the serotype 2 rAAV which expresses a hybrid of Channelrhodopsin-1/2 under CAG promoter fusion with reporter tdTOMATO. ChIEF is a hybrid of channelrhodopsin 1 and 2 with additional L170I mutation (ChR1 numbering) or at L131I (ChR2-numbering), leading to large currents in oocytes and HEK-cells and almost wild type like open state life time. ChIEF function as light-gated ion channels and very useful for many bioengineering and neuroscience applications such as photostimulation of neurons for probing of neural circuits. Using tdTOMATO tagged ChIEF, light-stimulated axons and synapses can be identified in intact brain tissue. This is useful to study the molecular events during the induction of synaptic plasticity. ChIEF has also been used to map long-range connections from one side of the brain to the other, and to map the spatial location of specific inputs on the dendritic tree of individual neurons.